It is always interesting to read old school versus new school on the web. Yesterday there was some fun had, witnessed by Ray Paulick's headline on his site ("Zast upset about transition to the web...written on his website") about Vic Zast's piece on the new reporting of racing on the web. It is funny that in this day and age we are still having this debate. Two of the most successful horse racing news operations today are The Paulick Report and Equidaily.com. Ray Paulick is perhaps as fine an example as we can uncover. He was a print guy, now he is not. Nice to see people like Seth and Ray in our business, rolling with the punches. It is intriguing to me that in racing (and to be fair elsewhere these days) you have to be for or against something, you can not like a little, or a lot of both. Twitter is something that seems to inflame passions. It is as polarizing as polytrack, and it seems either you like it or hate it. I don't love it, I don't hate it but I think it is here to stay and I think we should be using it better and more effectively. The people who like Twitter have a vehicle to learn something that they might not get from Standardbred Canada or the Bloodhorse. Great. The people who don't like it will not use it. Great, to each their own. But one mistake that can be made is ignoring it. By old media and new media both. For a case in point, as you know I follow the Tour De France as I find it consuming. In a way it is a lot like horse racing, and I like horse racing. This year American icon Lance Armstrong came back after a retirement and landed on the same team as the sports' newest star, Alberto Contador. Since the team needs to only pull for one person in this race, it was a match made in hell. There was friction from day one and it made the Tour something worth watching. Would Lance be team leader, or would Alberto? What were they feeling? The press conferences were at times fun, and the writing in old media was worth reading. But what were they really feeling? In the end we saw old world meet new. Alberto Contador, the race winner, was quoted in newspaper after newspaper and made news: "I have never had admiration for him and I never will." said Contador of Armstrong. He also said the Tour was a painful experience with Armstrong. What did Lance say back, if anything? Here is where it gets interesting. Lance is on vacation. No cameras, no press conferences, so no news, huh? Not so fast. Lance Armstrong is on Twitter and he responded: "Seeing these comments from AC. If I were him I'd drop this drivel and start thanking his team. w/o them, he doesn't win." and "A champion is also measured on how much he respects his teammates and opponents. You can win a race on your own not a grand tour." The Twitter updates made it to daily news stories in old time newspapers this morning. Fans who did not use twitter found out what Armstrong said because old media was following new media. This is a lesson for all of us, in my opinion. Progress might be stalled and some don't even have to directly use progress, but it will shape our lives, whether we want it to or not. In racing I have always been consumed by the Internet and what it can do for us as a sport. On the ADW front it is obvious. With platforms like betfair it is equally obvious. With things like Twitter it has been less so. But let's think about that for a second. What if we saw a feud between rival drivers or jocks or trainers, like we see from time to time? The news reports on that are always filtered and we rarely even hear about them. 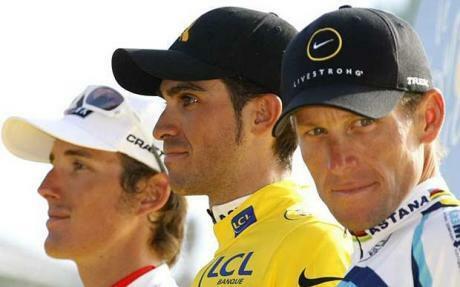 What if the protagonists were like Lance Armstrong and we got news from them completely unfiltered? I think it would be pretty darn cool. We can argue about new technology and new media, as we have time and time again, because it makes for some fun debate. But one thing we should never do is stop thinking about how it can be used - and made better - to grow the sport of horse racing. We failed with television, let's not fail again with the Internet.